I am a Sales Professional, working in the Software Industry. In most of the businesses I have been involved with, people register time spent on stuff done. By people, I mean the vast majority of my past and present colleagues. Time registered to invoice. Consultants, software developers, support engineers, project managers, business unit managers, most of my colleagues match activities and work to billable (or budgeted) items. Work packaged and bundled as product, or simply services billed directly to customers. Activities booked against project budgets, software features built against R&D budgets. Marketing activities matched with marketing budgets. Not so in the sales department. Although our main objective is to drive overall business, you will have a hard time linking my individual activities, meetings or tasks to result. None of my time is billable, so I must consider my sales work to be pure overhead. Maybe even the ultimate overhead. A side-effect of billability is that it allows to link work to measurable outcome such as revenue. Same goes for budgetted activities such as projects and activated budgets such as the Marketing budget. Sales also has a budget, but the dynamics of the sales budget work differently. So what about non-billable sales activities? Do none of the sales activities carry value? Or does all the sales work carry value? Likely, the answer lies somewhere in between. In the words of John Wanamaker, 19th century retailer and politician: “Half the money I spend on advertising is wasted; the trouble is I don’t know which half.” Which makes me wonder about sales time. When 6 consultants sit together in a meeting room there is an inherent risk of wasting time. 6 times over, no less. When marketing department plans events and campaigns, they will carefully assess where to dedicate focus and resource. Results of which may be hard to measure. Ever since online marketing, measurability has become a component in the marketing mix, resulting in more on-line, less in person. General idea is that predictable outcome drives value, and in order to predict, we need to be able to measure. In any case, once you have spent the budget you may need to postpone further actions until next year. Not so for sales people. No customer will pay for the sales meetings. Sales people will always consider that all time spent must be adding value into reaching sales budget. Contrary to project or marketing, the sales budget has no maximum. Sales people have targets, for sure, but never a maximum target to reach. Most of us even have accelerated bonusses to aim for, once we reach beyond. But in order to reach or exceed targets, sales professionals continuously need to ask whether time can be put to better use. For sales, billability is never a consideration. Most sales professionals will admit that assessing what to do next, for how long & who with – working against a clock most of the time, is part of how we can make a difference. Should I even be writing this article? In truth, I have very little control over where and when I can be most productive in my sales efforts. I believe that substantial part of deals come through formal or informal referral – whereas a relatively small portion comes through cold calling or direct lead generation. Or guest speaking at events. The unmeasurable, upredictable trumps measurabel actions. In the complex inetraction between vendors and customers, all activities have the potential to add value to the Business. But as there is no direct relationship between sales activity and sales results, we do not have a benchmark on when to decide (***) to do what. 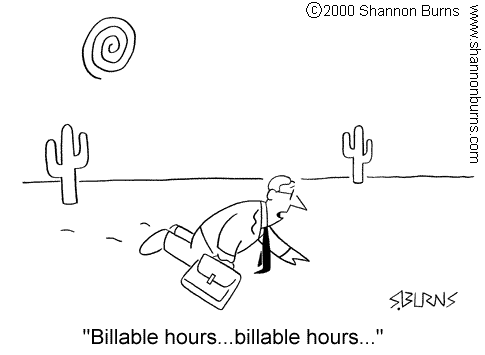 Then of course, not all of the time spent as billable actually gets billed. Creative marketing brainstorms, strategy sessions, customer workshops, internal training courses, pre-sale sessions. Valuable efforts, not relating to billable nor budgetted activities. A substantial percentage of time spent by the people I have worked with is spent in non billable work. Billability ratio may have a direct impact on revenue, it’s relation to quality of work is non-existent. Non billable activities by their very nature have no impact on revenue, but have the potential of impacting quality of work. In our meeting example above, if the value of direct interaction between 6 people does not have the potential of generating incremental return once they go back to their bills, then the meeting should not take place. Same goes for other non billable activities. If a sales meeting does not bring new insights to its participants, that meeting should have never taken place. Billability would never be a consideration, but time gets wasted nevretheless. Alas, most of the creative, not-directly-billable work is difficult to valuate. Will taking on a new certification yield in more productive work thereafter? How much time should we spend in exchanging ideas and experiences, intra company networking, team building, or … sales meetings? We all spend time, not billed directly to customers, yet all our time is paid for by them. I owe it to my customers to spend time wisely. (***) contrary to what you may believe, doing more of the same does not automatically extrapolate in getting better results – yet that seems to be the baseline assumption.